Discussion in 'Studio Scale Models' started by John Cooley, Oct 19, 2011. 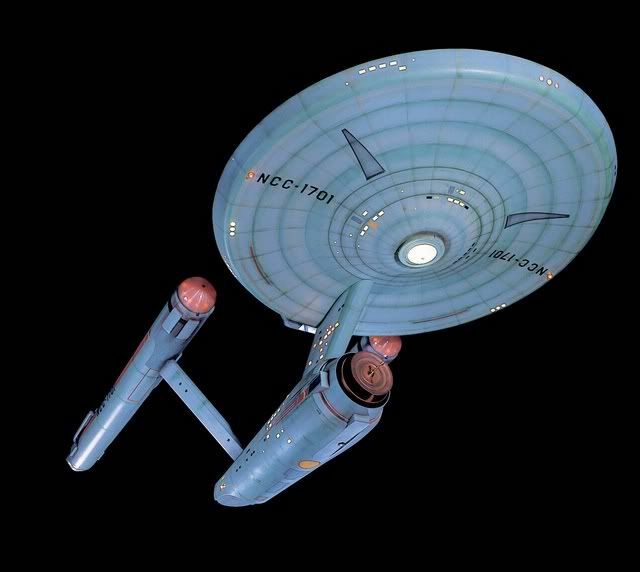 So back on September 8th 2011 (the 45th Anniversary of the premier of STAR TREK), The Facebook page of the National Air and Space Museum put up this photo of the original 11 foot ENTERPRISE. They also posted a blurb celebrating STAR TREK and the model in their gift shop. I can’t stand the changes that Ed made to the ship, but worse than that, in the twenty years since her last restoration new damage can be seen on the model and working in the F-15 community, I know that for every problem you can see there is almost certainly more substantial damage you can’t see. I politely posted something about the ship needing a restoration on NASM’s Facebook page only to have it disappear within a matter of minutes. Feeling bad about name dropping Steve without talking to him first, as soon as I was finished talking to Mike and Denise, I messaged Steve who called me right away. I made an new friend instantly, and within a day Steve had called Doug Drexler who sent me an email, and we’ve been rolling ever since. More in a bit, I have a diaper to change. Sorry. First baby and all. I'm in support for sure and I attempted a small personal effort at one time to draw attention to this some years ago. I had even met personally the NASM curator of that section that contains the model. A big donor has to want this done. They have their hands full at the NASM to say the least. Like a Paul Allen type perhaps, which I also tried to contact. Though times change, and a big fan effort should never be eliminated as being successful. Now that's a studio scale model! And a one-of-a-kind cultural treasure that deserves nothing less than the kind of restoration you guys are discussing here. Good luck fellas. Would that have been The Smithsonian's Dr. Margaret Weitekamp? Did you try Mr. Allen through VULCAN INC? Good luck with that. Dealing with the government isn't very easy. I figured the original E is a lost cause, which is one reason why I'm building my own ships. It's going to require major rework, you can't just restore it. The structure would need to be augmented. I wouldn't rely on the 45+ year old woodwork. Yes to the former, for the latter I tried through his museum. It can be done, you will have to have patience though. I'd love to know how anyone thought even half the stuff done to that model was acceptable. I mean, replacing detailed signage decals with lame jokes? Why anyone with any reverence or respect for a cultural icon like the Enterprise would think it acceptable to replace the original signage with lame jokes of their own making is beyond me. It smacks of the worst kind of hubris in my opinion. I met Ed Miarecki a few times many years ago at a local Sci Fi model Club, we were both members,( I still am, he's not)I was always struck by his arrogant demeanor, as if our model work was lesser than his simply because he worked in the industry. In his mind I am sure he thought, I just made the Enterprise better than the guys who designed and built it. :thumbsdown I can't wait to see it done correctly. Made it 'better' than Matt Jeffries original work? Not possible. Doug's all in (though he's up to his eyeballs in Blood and Chrome right now). And we're currently waiting to hear back from Greg as he was actually all of our first pick to head the physical restoration team with Steve as either his lieutenant or co-consul (that's up to the two of them). Greg's nine day wonder is something that we all remembered and Doug was adamant the Greg was key to our effort. I wholeheartedly approve this effort. Miarecki's repaint is pretty galling to look at. I didn't know about the jokes. Could someone describe them? So, now that the team is assembling, has the NASM responded? Are there any rumblings of support from within the Smithsonian? while I certaily can see the woodwork of the original needing soem help I can see a restoration being successful. However as Steve did with his 1/2 scale model a support harness needs to be included. I'm thinking thick acrylic supports so you can see the mode even as its being supported. I too support this effort 110%. Steve is definitely the right man to have involved in this project, given his awe-inspiring half-scale studio Enterprise he just finished up. It'd be great to have the desired "dream team" work together on getting the original grand ol' lady restored to her proper glory. Can't believe Ed went ahead and altered some of the surface details. That smacks of total disrespect to those who built her in the first place, imho. 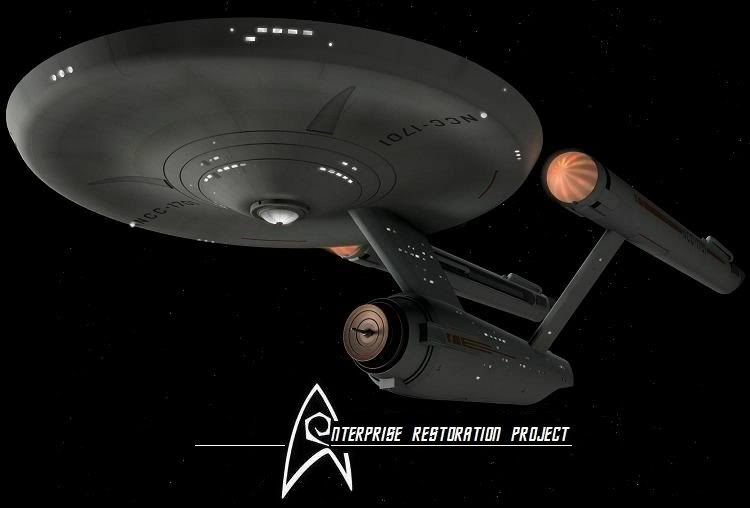 "As well documented on The IDIC Page, the original USS Enterprise studio model underwent an overhaul at the Smithsonian Institution National Air and Space Museum (NASM) during December 1991-January 1992. This was in preparation for the NASM's 1992-93 Star Trek exhibition. The model was renovated by model-maker, Ed Miarecki, who we consider to be one of the finest model/prop makers in or out of Hollywood. During the exhibit, we noticed that the original "Tail Pipe Socket Adjustment Access" sign decal, just below the starboard pylon on the secondary hull, had been removed. The first photo below shows the original "Tail Pipe" sign, and the second photo shows the Miarecki-renovated model without the sign. Now comes this photo from the 1992 display, courtesy of Frank Allen, which shows that the original "Inspection Door Vent Systems Connection" decal on the lower saucer section was replaced with a "joke" sign, which says, "Do Not Read This Sign!" We asked Ed Miarecki about this, who responded, "I never believed that those little signs were original to the model, since the model was repainted by NASM (during a previous renovation)...if you have evidence to the contrary, I'd love to see it." Well, the only evidence we have are copies of the original decal sheets for the 11-foot Enterprise model. 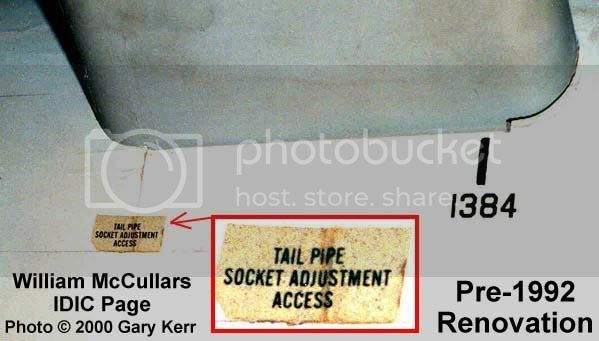 These decal sheets have mini signs, such as "Inspection Door Vent Systems Connections," "Tail Pipe Socket Adjustment Access," as well as numerous others, which are identical to the one shown in the 1982 photo. The NASM never had access to the original decal sheets, which The IDIC Page got from a former Desilu/Paramount employee who obtained the sheets during 1972. To our knowledge, these decal sheets are the only surviving originals for the 11-foot model, which had been stored by the owner in a closet for 25 years. 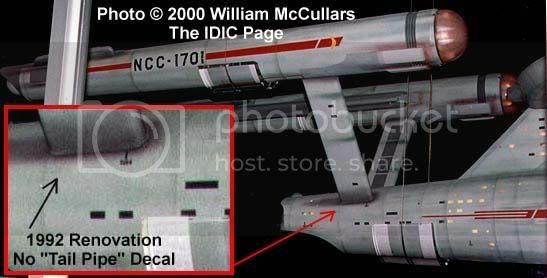 Further description of the original decal sheets is shown on this page: The IDIC Page - Original Enterprise Decal Sheets. Hopefully, the original signs can be re-applied to the model during the next NASM renovation. Incidentally, the "joke" signs were removed from the model for the NASM's year 2000 exhibition." So, if I read this right, it sounds as if during the 1982 renovation, the renovators painted around the original signage as they had no access to the original decals and it certainly would appear to be the case as the paint behind and around the original lettering definitely looks to be older and more weathered than the paint used for the rest of the hull. It also sounds like Ed Miarecki arbitrarily decided that the signage wasn't original and this gave him carte blanche to eliminate or alter them. It is a shame they did this and it should be put back as it was. Things go into the Smithsonian to be preserved for everyone to see and study. Unfortunately they have a track record of * up restorations. The Enola Gay comes to mind. Hopefully they will listen and do the right thing. Please add it to the punch list. Refit Enterprise Polar Lights help!! !